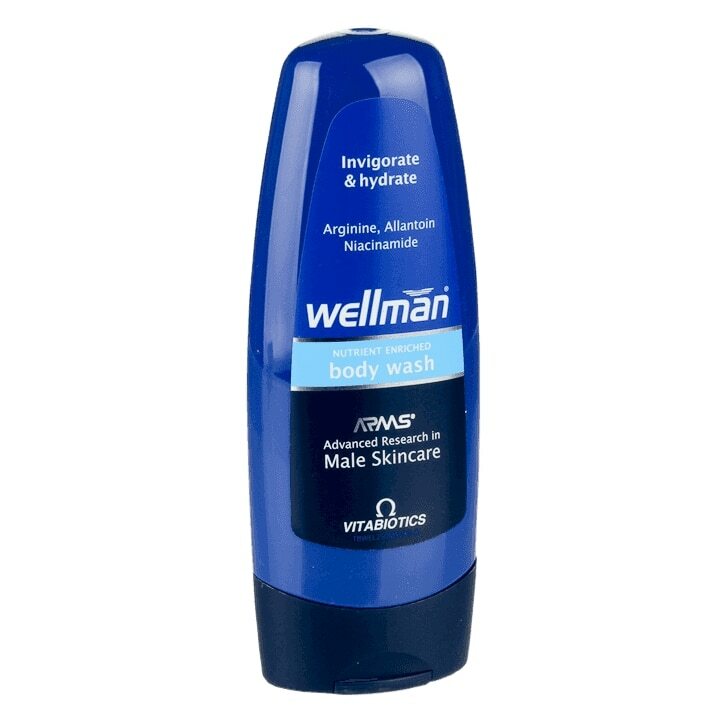 Formulated especially for men, Wellman® Body Wash is an advanced shower gel that cleanses the skin, removing pollutants and perspiration while hydrating to replenish lost moisture. Advanced Research in Male Skincare (ARMS®) to cleanse and moisturise leaving skin soft & supple. An invigorating active formula with Arginine which helps control moisture balance in the skin cells and Niacinamide which helps to strengthen the skin barrier for firmer looking skin. With naturally occurring biolipids to help keep skin smooth and supple for up to 24 hours after showering. Use daily. Massage a small amount onto damp skin in a circular motion. Rinse well with warm water and pat dry. Avoid direct contact with the eyes. Aqua (Water), Sodium Laureth Sulfate, Cocomidopropyl Betaine, Coco-Glucoside, Glyceryl Oleate, Parfum (Fragrance), Sodium Chloride, Benzyl Alcohol, Phenoxyethanol, Sodium Benzoate, Quaternium-80, Sodium Hydroxide, Propylene Glycol, Arginine, Niacinamide, Allantoin, D-Limonene, Alpha-Methyl Ionone.